Peter J. Pappas, Sr., Chairman of the Board, P.J.M. Holdings Corp., and Philanthropist. Larry Michael, “Voice of the Redskins,” and senior vice president and executive producer of Media, Washington Redskins; was the evening’s emcee. More than 300 participated at the Dinner – Special event guests included Ambassador of Greece to the United States Christos Panagopoulos, Consul Konstantinos Polykarpou; U.S. Senator Mazie K. Hirono (D-HI), former U.S. Senator Paul Sarbanes, Congressman John Sarbanes, Congressman Chris Van Hollen, former American Ambassador to Greece Thomas Miller, Founder of AHI & the AHI Foundation Eugene Rossides. AHI volunteer legal counsel and Board of Directors Treasurer Nicholas G. Karambelas, Esq., partner in Sfikas & Karambelas LLP, introduced Michael. The Marines of Headquarters Battalion presented the colors and the American and Greek national anthems were performed by Maria Pearce. Rev. Steven P. Zorzos, Presiding Priest of Saint Sophia Greek Orthodox Cathedral, Washington, D.C., offered the invocation and benediction. Apollonia provided the musical entertainment. Opening the evening’s program were AHI President Nick Larigakis and AHI Foundation President Dr. Spiro Spireas, both of who offered greetings. They also reviewed the initiatives and programs that AHI and AHIF provide the community. 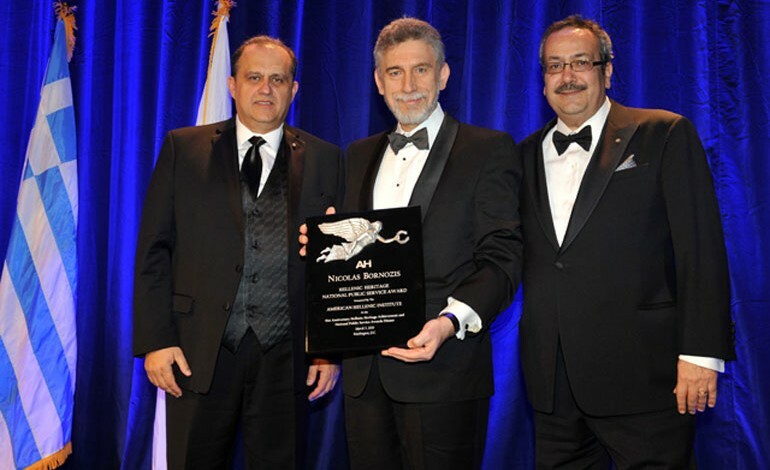 Basil N. Mossaidis, who is the executive director of the American Hellenic Educational Progressive Association (AHEPA), the largest and oldest association for American citizens of Greek heritage and Philhellenes, accepted the AHI Hellenic Heritage National Public Service Award for his extraordinary efforts to promote and advocate for Hellenism in the United States. In acceptance, Mossaidis thanked AHI President Nick Larigakis and AHI for the honor. He also thanked his parents and recalled his upbringing in a Greek household as the beginning of his journey to where he is today. Rena Papapostolou received the AHI Hellenic Heritage National Public Service Award for her tireless promotion of Hellenic art and culture through music and dance through her work as co-founder of Return to Origins, a Greek cultural and educational program aimed at fostering Greek culture and heritage and strengthening Greek ecclesiastical tradition, especially among the youth. Papapostou accepted the honor with deep emotion and gratitude toward AHI and on behalf of her late husband, with whom she founded Return to Origins. In acceptance of the AHI Hellenic Heritage National Public Service Award for his outstanding achievements fostering strong economic ties with the Hellenic world, Nicolas Bornozis, recalled his beginnings in the capital markets and international finance industry, working for a French bank in the United States, eventually becoming its CEO. Twenty years ago, he started Capital Link, a leader in investor relations for the shipping industry, closed-end funds and companies seeking access to the U.S. and European financial markets. Capital Link organizes 12 large-scale investment conferences annually in Athens, New York, London and Shanghai, attracting as many as 1,000 delegates at some venues and spurring investment and business opportunities in Greece. This is the second award for Mr. Bornozis and Capital Link this year as on Thursday, February 18th, 2016, he received the “1st Propeller Club of Piraeus Members Award” by The International Propeller Club, Port of Piraeus for his contribution in strengthening the bilateral relations between Greece and the United States of America in the Maritime Field and for his efforts to raise the profile of shipping in the investment community and to a wider audience around the world. Capital Link’s efforts have also been recognized by the 2011 Greek Shipping Lloyds Awards and in 2012 and in 2013 by the Intercontinental Finance Magazine in London. 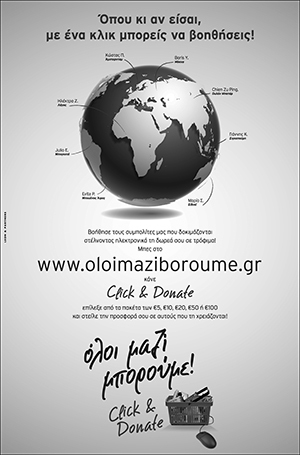 Several political and business leaders from the United States and Greece provided video testimonials on the work and contribution of Mr. Bornozis, including former Prime Ministers Antonis Samaras and George Papandreou, John Paulson, Wilbur Ross and many more. Peter J. Pappas, Sr. received the AHI Hellenic Heritage Achievement Award in recognition of his entrepreneurial spirit, philanthropic endeavors, and fidelity to Hellenic causes. Pappas is the Chairman of the Board of P.J.M. Holdings Group, one of the largest HVAC and mechanical contracting firms in the United States. 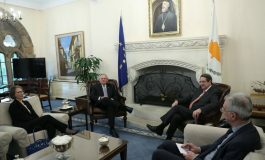 The American Hellenic Institute is an independent non-profit Greek American public policy center that works to strengthen relations between the United States and Greece and Cyprus, and within the Greek American community. 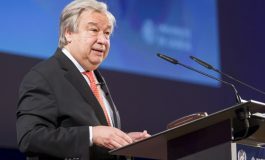 AHI has become the leading forum for addressing important issues that affect the U.S.’s relationship with Greece, Cyprus, and Southeastern Europe. It is a well-respected lobby, think-tank, business network, and educational foundation that informs and influences leaders, policymakers and citizens alike.